What Makes a Good Jigsaw? When there is a need to cut both straight and curved lines, the need to plunge a circle in the middle of a piece of lumber or tile, want to make intricate cuts for custom furniture, turn to a jigsaw. This versatile tool is part hacksaw, part fine woodworking design cuts, all with the same instrument. 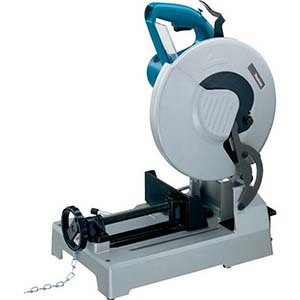 It can tackle wood, metal, plastic, tile and other materials with the appropriate blade. 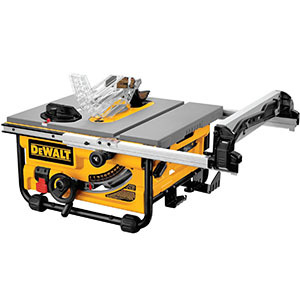 It has the ability to make intricate cuts as well as rough cuts, making this the go-to tool for many DIYers and professional contractors. The jigsaw was first brought to market in the 1940’s when an engineer used his wife’s sewing machine for intricate cuts. The idea was born for a tool that would be powerful enough to tackle construction jobs yet intricate enough for detailed cuts. This tool can successfully make straight, curved and circular cuts depending on your needs. We initially evaluated 23 different models of the top jigsaws on the market and narrowed the list for further testing. With a focus on cordless jigsaws, the completion of our tests brought to light the quality of the Dewalt DCS331M1 as the decisive winner. It has the speed and power needed for heavy duty jobs with the precision for fine craft work. The unit battery is powerful and lasts through 107 rip cuts without needing a battery change. This was among the longest battery life tested. The unit also includes some valuable bells and whistles that makes using the device simple and straightforward. It only weighs 6.8 pounds with the battery. A jigsaw is one of the most versatile tools on the market making it a must have for your tool collection. The cordless models give you portability that is not available with the corded models. They can be used without requiring electrical outlets close by. If you need a jigsaw over a long period of time, getting a second battery will solve longevity concerns that may come with a cordless model. With the wide range of applications a jigsaw offers, getting a quality device will truly give you the versatility the saw can master. Less expensive models cannot tackle difficult material effectively due to lower power capabilities. If you want to do more than cutting a few pieces of wood here and there then a top quality jigsaw will pay for itself in speed, precision and cut accuracy. Jigsaws range in price and price is a good indication of quality. Lower end jigsaws tend to have weak motors and no additional features that ensure accurate cuts and the ability to cut various materials efficiently. Higher end Jigsaws come with a stronger motor, providing a more precise curt, a more powerful battery, and other features like quick blade changes. Most DIYers and homeowners will need to own a jigsaw, and it is generally not necessary to purchase a professional grade saw to get 90% of the projects homeowners tackle. The jigsaw not only provide power but it also offers an element of artistry for those looking to design furniture, create artistic pieces or complete craft projects with wood or plastic. Once you have a motor powerful enough to cut any material you will use, you will need to purchase blades that will be specific to the type of material being cut. For intricate cuts the blade choice becomes essential to having a quality piece when you are finished. There are two basic types of jigsaws. The D handle and the barrel grip. The D handle is the most common and provides a firm grip that is in the shape of the letter “D”. The barrel grip is harder to hold with two hands but tends to be smaller than D handle saws. 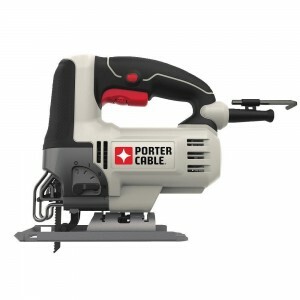 Cordless versus corded choice is mostly about portability, maneuverability, and need for power. Higher end cordless jigsaws offer compatible power to their corded counterparts. Lower end cordless saws lack the power to compete with corded models with similar features. Cordless jigsaws offer the convenience of being able to travel anywhere needed to use the saw. The cordless models are also better for maneuvering because you are not concerned with cutting the cord. Important additional features when selecting a jigsaw start with blade changes. If you use the saw frequently you will have frequent blade changes. Models that change blades without requiring a tool are fast and efficient. Those requiring a tool should offer on-board storage for the tool so that it does not get misplaced or lost. Types of blades are either a T shank or a U shank. These are not generally interchangeable. Orbital Action. The typical saw blade moves up and downwhen cutting material. Orbital action provides the ability to move up and down as well as front and back, creating more power. When cutting intricate pieces you want the ability to turn the orbital action feature off for more precise cuts. Variable speed is a great feature because it gives you more control. You can adjust the trigger to control the speed of the blade. Different material is easier to cut at faster or slower speeds. For example wood can use a high speed where metal is cut better at a lower speed. Precision work also benefits from greater speed control. Ability to make bevel cuts. Not only do jigsaws offer straight, curved and circular cuts, some include the ability to cut angles. Having positive stops provides easier angle adjustments and great accuracy when making angled cuts. Guides provide more accurate cuts. Given that a jigsaw is operated free hand, the guides can be very helpful in keeping the cuts more exact. Light will help you see the work space better and can improve accuracy. A dust blower will keep the area free of debris and sawdust enabling you to make more precise cuts with better visibility. 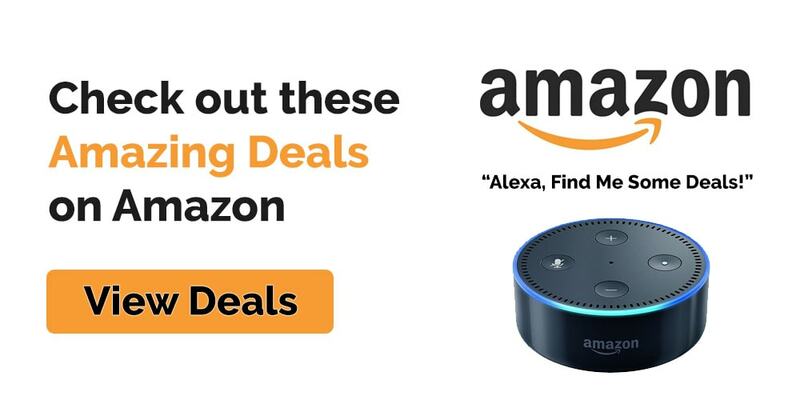 We completed extensive research reading blogs on tools, connecting with tool companies and specialists, and working with professional contractors to provide detailed information on what features were worth the increase in price and what would be considered must haves. We then tested and evaluated the top picks to draw our own conclusions about which saws would provide the best value for the price. We then researched jigsaws on Amazon and studied the reviews as part of the evaluation process. The Dewalt DCS 331M1 is a high powered tool that makes accurate cuts, is easy to operate and has a powerful battery that will last a long time even with active use. The battery can be charged in as little as 40 minutes and has a fuel gauge so you can determine when the battery must be charged. In addition to the long life battery, it comes with a variable speed motor that adjusts up to 3000 strokes per minute (SPM). The level action is all metal and it features an anti-slip grip for greater comfort and control during use. This jigsaw has the ability to cut beveled angles and has 4 positive stops up to 45 degrees. Both the bevel angle changes and the blade changes do not require any tools making it fast and easy to get the saw ready for the cut you need. The shoe is also adjustable and does not require any tools. The orbital action on the blade gives the saw more power when you need it. When the orbital action is turned off you are able to turn in a dime and make very accurate cuts for intricate work. The Dewalt DCS 331M1 also features a dust blower that will keep your line of sight clear during the cut. This machine has more power and better control than its competitors making it our top pick. When you purchase the Dewalt DCS 331M1 it comes with the jigsaw, blades, battery, a charger and a hard case. If you do not need a battery and charger you can buy the jigsaw without the extras with the DCS331B model. 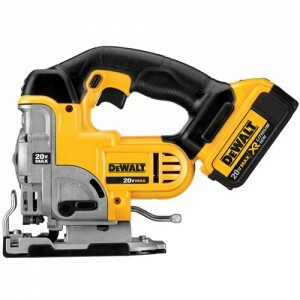 Popular Mechanics tested the Dewalt DCS331M1 and concluded that the “saw combines speed and power with endurance. Its cutting action is smooth, even in a tight radius. And it has tool-free bevel adjustment.” Making it one of their top picks. 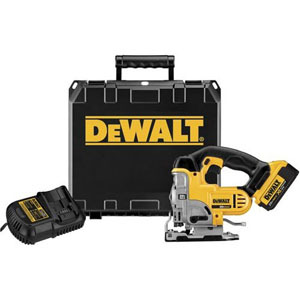 Amazon rates the Dewalt DCS 331M1 with 4.9 out of 5 stars with 24 reviewers. One five star reviewer concluded that is has, “Unbelievable power for a cordless tool. Very, very solid and just overall exceptional quality.Grips the blade very well, zero wobble and doesn’t go through batteries like butter. The Festool 561677 Carvex PSBC is a best in class for higher end jigsaws. 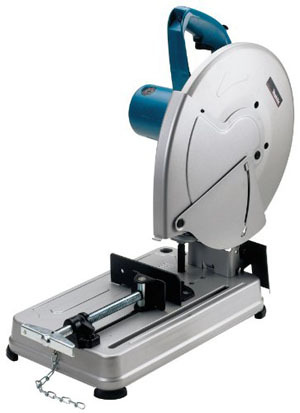 It offers a variable speed motor with up to 3,800 PSMs and triple blade guard guidance allowing precision and true cuts. The splinter gauge gives you zero clearance for more accurate cuts. There is also an LED light for a clear view of the cutting surface. The Festool comes with a high end brushless motor which makes the tool lighter, more powerful and will last longer than standard jigsaws. If you need a powerful tool the can handle heavy duty work conditions then this is the best jigsaw available. This power and precision is often the choice of professional craftsmen and contractors. The care of a jigsaw is mostly about keeping the tool clean and lubricated. The blade area needs to be free from buildup so the blade does not stick. A few tips for using the jigsaw safely include: ensuring the work surface is clear, and the material being cut is clamped or secured. The use of sawhorses can help to stabilize larger pieces. It is also a good idea to have a place for pieces to drop if you are cutting pieces that will be clear from the main board. Good light is also essential to making intricate cuts and cutting accuracy. Other safety precautions include wearing safety gear, ensuring the machine is turned off before changing blades and making sure you have proper balance when working at odd angles. The jigsaw is a tool nearly everyone will find useful. It can be used for home repairs, crafts, and cutting a wide range of material. It has the ability to make both rough and intricate cuts, making this a popular tool among those who work on their home or work with arts and crafts.